I categorically love steak. There you go, confession is out. I am such a fan, I have even planned my Death Row meal (in the very unlikely event of every being incarcerated for a crime worthy of capital punishment, and in the US at the time) and a damn fine steak has to be the main course. Nothing comes close. I am such a steak fan that I equally get immensely upset when cooked badly. I can be quite vocal about it. Sorry. Whilst I can thoroughly enjoy a steak in its simplest form – pan-fried, high heat for as short a time as possible, pinch of salt and a good grind of pepper, I also love a good sauce. Really I do. I have been working on my recipe for many months (not concurrently- I am not that obsessed) and think I have got it just about right. In a large frying pan, heat up some olive oil (medium heat) + add the shallots and rosemary, until they soften, then add all the mushrooms, grated garlic and peppercorns. Sweat them down until mushrooms have softened, but still keep their texture. Remove from pan and set aside for later. Then, whack up heat, cook steak to your liking with salt/pepper – then remove steaks, wrap in foil, and keep in warm place (for me, oven @ 40-50 degrees C works well – do not overheat the oven otherwise you’ll cook the steaks too much). Alternatively, an warmed plate pre-heated in the oven works well. Let the frying pan cool down a little, and return mushroom/shallots. Warm up the pan (making sure ingredients do not burn) then add the brandy, and as it starts to bubble ignite (keeping an eye on hair/eyebrows etc ;o) Once flames have subsided, reduce the heat and slowly pour in the cream. (if too hot, the cream will cook which spoils it a little). As the cream warms through the other ingredients, add the Dijon mustard and stir through. Season to taste. Remove steaks from foil and pour sauce on top of them. Serve immediately on oven warmed plates. Why not accompany the steak with some home made chunky chips in coconut oil, and Steamed Broccoli in garlic and red chilli ? Previous Post: « Flambéed Pear, Blue Camembert and Walnut Salad. this steak is to die for! 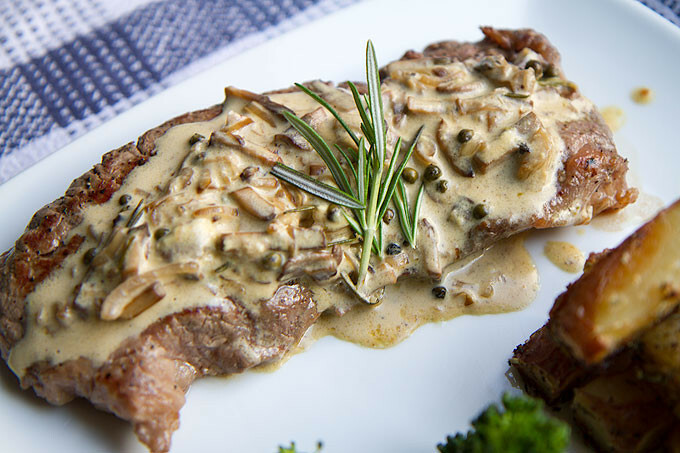 the meat is so tender that it melts in the mouth and the peppercorn sauce is out of this world. must be one of my favourite dishes and I’m a big foodie! 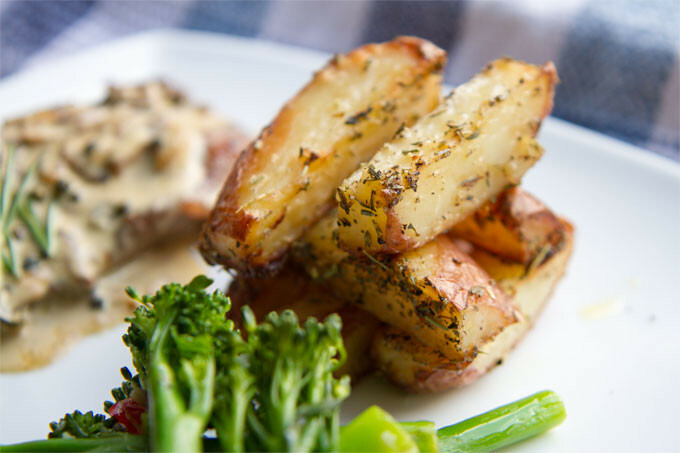 Truly gorgeous recipe, for all steak lovers out there. I had mine done medium/rare and accompanied by a full body french red – absolutely to die for.